What’s up, forex friends? The BOC ain’t the only one with a monetary policy huddle this week since the ECB officials will also have a little gathering, and they’ll be announcing the results of their meeting this Thursday (Jan. 21, 1:30 pm GMT). During their Dec. 3 rate decision and press conference, ECB officials pretty much maintained their monetary policy, but they did cut the deposit rate by 10 basis points to -0.3% from -0.2% and they extended the €60 billion/month quantitative easing (QE) program by six months. They also decided to include “euro-denominated marketable debt instruments issued by regional and local governments located in the euro area” in their list of purchasable assets for their QE program. Overall, the easing moves were less than what most market players were expecting, which is why the euro spiked higher across the board. If you’re wondering what was up with that, just know that market players have been pricing-in more easing moves ever since the ECB took a starkly more dovish stance during their Oct. 22 rate decision and presser. And it didn’t help that rhetoric from ECB officials in the-lead up to the Dec. 3 decision heavily implied more easing moves. However, the additional measures failed to meet the market’s (*cough* over-hyped *cough*) expectations since the the 10 bps cut was deemed too shallow and the QE program was extended but not expanded. That was seen as good news for the euro since expanding the QE program would involve printing more euros for bond-buying purposes, which would devalue the euro. As such, a lot of forex traders used the event as an opportunity to unwind on their euro shorts while European equity traders were very dismayed and sent European equities on a cliff diving mission, which then generated capital flows from European equities to the lower-yielding euro, pumping up the euro all the more. Most market analysts expect the ECB to maintain its current policy, so most forex traders would likely be focusing on the ECB’s tone or monetary policy bias instead. In short, the unnamed ECB officials were heavily implying that they don’t wanna ease no more. Also, the results of the January 2016 euro area bank lending survey were released yesterday and the report noted that “Further improvements in borrowing conditions for businesses and a return to an easing of standards for housing loans” and “Further increase in demand for loans across all loan categories but particularly by businesses,” which could be a sign that the ECB’s monetary policy is taking effect. 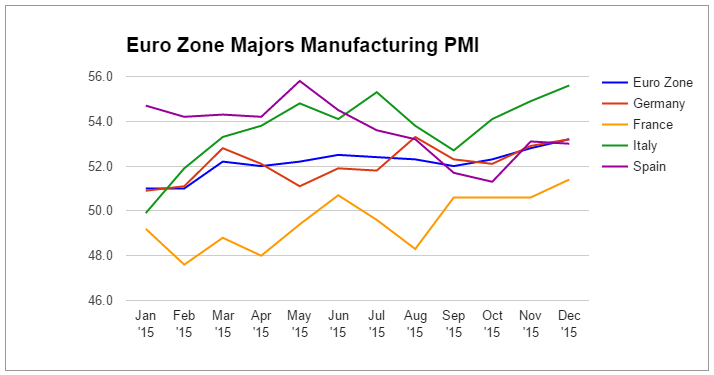 In addition, PMI readings for the euro zone have been improving recently, which is another promising sign. Tha t’s well and good, but the headline CPI has been consistently below the ECB’s forecasts while the core CPI reading remained relatively low, and that’s not even considering the recent oil slump to 12-year lows and the implication that the euro zone’s inflation levels will remain low for longer. Given all the above, ECB Emperor Draghi is likely to deliver a more balanced tone in the upcoming meeting but with some hints of dovishness, so watch out for deviations from this tone since that would likely cause the volatility of euro pairs to spike. If the ECB delivers a more hawkish stance or communicates that it is very reluctant to ease further, then the euro will likely climb higher. The former scenario may even potentially cause sentiment in the European equities market to turn sour, sending capital flows towards the lower-yielding euro. In contrast, a much more dovish stance and/or explicit calls for more easing moves would likely cause the euro to weaken against its forex rivals. What are your expectations for the upcoming meeting? Will the ECB maintain its current policy? If they will, what tone do you think will they adopt? Make sure to let others know by answering our poll and/or commenting below.